I did this once years ago, and it worked really well. 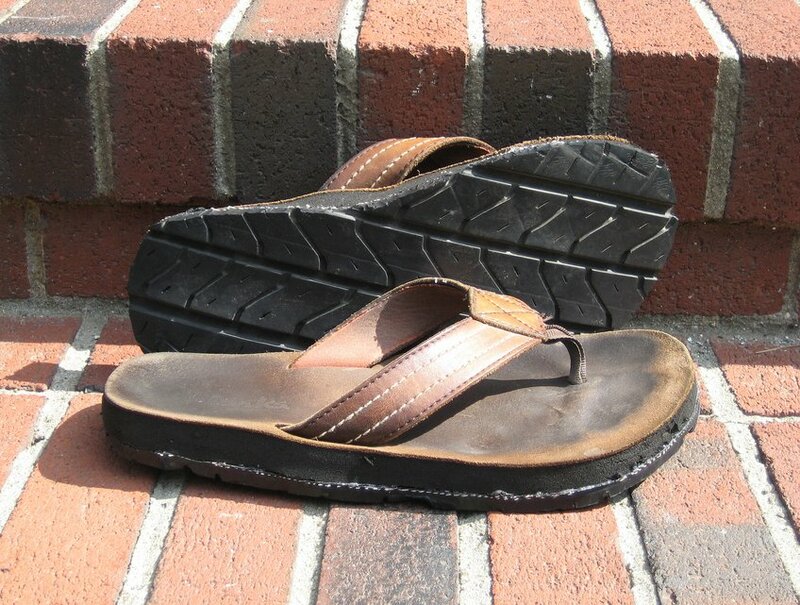 Take an old tire, and recycle it to make indestructible shoe soles. Tire tread is designed to handle way more abuse than simple walking can dish out. My current sandals were starting to wear down, and it was time to do it again. There’s just one issue when using a tire: there’s a steel mesh embedded in the rubber. It rigidly holds a curved shape, which is not what you want. The solution I came up with was to fillet the tire, keeping the tread and leaving the steel behind. Good stuff. Beyond that it’s a straight-forward process. You remove the old soles and glue the new ones on. The rest of my sandals will fall apart long before the soles do. I took a bunch of pictures. Should make for a decent Instructable. This entry was posted on Sunday, August 2nd, 2009 at 9:48 pm	and is filed under Craft. You can follow any responses to this entry through the RSS 2.0 feed. You can leave a response, or trackback from your own site. I picked up some “Shoe Goo” at my local hardware store. It’s been working great! It’s only been a month though, so I can’t vouch for long term durability. If they start falling apart I’ll be sure to post an update. Another thing I did that might help: while the glue was drying I applied A LOT of pressure. (All my old engineering textbooks. HEAVY) My sandals are flat so it was easy. I’m not sure if you can do the same thing with your Chacos. Try scuffing the inside of the tire tread with a rasp or scoring it with a utility/xacto knife to help the glue adhere better. “Shoe Goo” works really well because it remains slightly flexible when it dries. Yeah I wound up doing that indirectly. I filleted the tread using multiple short cuts with a utility knife, which left a fairly rough surface. Two summers of use (including standard water exposure) and the shoe goo shows no signs of weakening.